PRK, known medically as Photorefractive Keratectomy, is a procedure that reshapes the cornea to correct myopia or nearsightedness. Like LASIK surgery, PRK corrects refractive errors such as myopia, hyperopia, and astigmatism, although it does so in a different way. For carefully selected patients who may not be good candidates for LASIK surgery, PRK offers the opportunity to be less dependent on glasses and contact lenses. If you have thin corneas, LASIK surgery is not recommended. However, you may be a good candidate for PRK if you are over 21 years old and have stable vision. Prior to scheduling your PRK procedure, you will undergo a complete eye examination. In addition, your overall medical history will be reviewed to ensure that there are no other factors which would prevent you from being a good candidate for PRK. PRK surgery is an outpatient procedure. On the day of surgery, you will be welcomed by the staff and given booties to cover your shoes and a cap to keep your hair away from your face. Prior to the procedure, numbing drops will be placed on your eye, and you may be given a mild, oral sedative. This is to make sure you are comfortable during your treatment. After entering the Excimer laser suite and reclining on the laser bed, the eye surgeon will carefully place a fine instrument between your eyelids to help you remember to keep them open during the PRK procedure. The laser eye surgeon will first need to gently remove the outermost layer of the cornea, which is called the epithelium.This can be done by the surgeon lightly rubbing the surface of your eye with a dull instrument or directly with the laser. Your eye surgeon will use the advanced technology of the Ladarvision Excimer Laser System to reshape the curvature of your cornea in order to create the necessary power correction for your exact condition. This laser technology actually measures the exact position of your eye thousands of times during the treatment and adjusts the precision application of the laser. Prior to your arrival, your PRK surgeon and staff will have programmed the computer with the measurements and calculations gathered from your consultation. 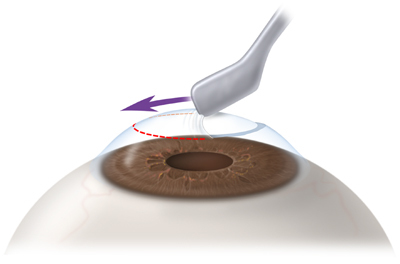 Rather than applying the laser in a “beam”, it delivers the laser to the surface of the eye in very small microspots, in a pattern selected by the computer in order to obtain the smoothest treatment and best vision correction. By using this 'scanning-tracking-spot technology', PRK patients at Kadrmas Eye Care New England receive a smoother PRK surface treatment and experience a quicker and more comfortable visual recovery than others might have in the past. You should not be alarmed by the need to remove the thin epithelial layer in the PRK procedure. Your surgeon will place a comfortable 'bandage contact lens' on the surface of your eye after your treatment. This helps your eye heal and provides comfort and protection for the surface of your eye. 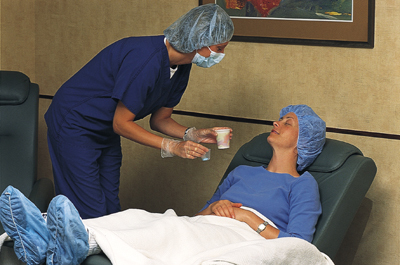 After your surgery, you will rest in a comfortable reclining chair, and we will offer you some refreshments. Your family members may then join you in reviewing your follow-up care and schedule. Some PRK patients, during the first day or so after the procedure, may experience mild to moderate discomfort which feels like grittiness or sandiness. Your doctor may prescribe some additional eye drops to make you comfortable, control or reduce any inflammation that you may have as you heal, and prevent any infection during the healing process. It is important that you carefully follow all of the instructions you are given regarding eye drops, medications, and the schedule of follow-up visits. The night of the procedure, our staff will call to check on how you are feeling. The following morning, you will see your doctor so that he can monitor your progress. You will also be required to return for a number of follow-up visits to check the healing process over a period of months. The entire outpatient PRK surgery will take approximately two to two-and-a-half hours. Following your surgery, you will be able to return home. However, you will not be able to drive home. Therefore, you should make arrangements for someone to drive you. Both LASIK and PRK surgeries produce the same vision improvements. Because a thin layer of epithelium is removed in PRK surgery, it does take a little longer for you to heal. While healing times may vary, most PRK patients are able to resume their normal activities within three to five days. During your consultation at Kadrmas Eye Care New England, our doctors will thoroughly consider your individual lifestyle needs, eye health, and prescription and help you select the best treatment option for your situation.